Third Man is grateful to Mr Aleksandra Orlov for sending him this photograph. Thanks also to Getty Images and Cricketer International for the chance it gives to show young and old alike the similarities in technique of two wonderfully free spirited cricketers. Orlov writes that he was inspired by the description of Bob Barber to look up the image from CI. 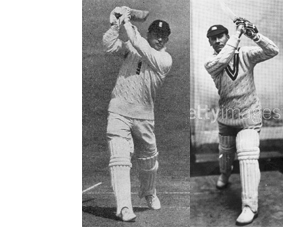 Seeing it had reminded him of a old photograph of Jack Hobbs batting in an indoor net. What both batsmen appear to have lacked in a high elbow they made up for in bat-speed. Compare the Drive dot com is born.